Mango season is almost through and the mangoes that are available now are thotapuri (called collector kaya in andhra) and bainganapalli varieties which donâ€™t have much of a sour flavor. They are best suited to prepare curries which have a predominately sweet flavor. It would be a whole year before I prepare Mamidikaya kura again, during the next mango season, so made this curry for lunch today. A simple, straightforward mango curry recipe using onions, tomatoes, chilli powder, jaggery and tempered with cumin and fenugreek seeds. Pre-heat oil in a heavy bottomed vessel. Add mustard seeds and let them splutter. Add the methi and cumin seeds and let them turn brown. Add the crushed garlic flakes and fry for a few seconds. Add the chopped onions and sautÃ© till pink. Add salt, turmeric pwd and chilli pwd and combine. Add the chopped tomatoes and cook for 5-6 mts. Now add the mango pieces and mix well till they are well coated with the masala mixture. Cook covered for 4-5 mts on medium heat. Add water and cook on high flame for 5 mts. Reduce heat and cook further for another 8-10 mts or till the water evaporates. Add the grated jaggery and cook for 10 mts on low flame till water evaporates and you get the curry consistency. Serve with hot steamed white rice or rotis. 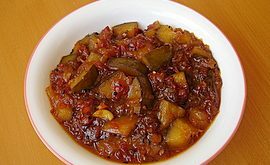 This curry resembles more of a sweet pickle. I would definitely love to have this with rotis as u said..Will let u know when I give this dish a try!!! I am drooling…….lovely pics. I wish i could get some here . But have to wait for looong time to taste it. Enjoy! the mangoes. Nice mango curry I never actually tired this. Looks good. Maybe you should try it next summer during mango season, Radha. Mmm! I love mangoes in any form! I am glad your guests enjoyed this recipe, MangoJoe. the way u describe and narrate your recipies is fantastic. idi naku chala istamaina koora. i am glad that a vizag girl is making gr8 recipies. My children just loved it. and guess what, they ate the whole dish leaving none for me. I guess i have to make it secretly.